Does mystery remain when ruins are assigned a history? On a small beach on the western side of the San Francisco peninsula lies a large, rectangular pond. Wide strips of rusted metal bolted to the concrete foundation rise up a few inches before curving back towards the water and disappearing into the thick algae. Beside it stands a tall square, also concrete, covered in graffiti. In the hills surrounding the beach century-old bones of iron jut out of the dirt at odd angles only to dive back in again. These strange ruins of times long past sit, waiting, for anyone curious enough to explore. Yet the day I found them I felt as if I had stumbled upon something no one had seen for years. It was late December and I had taken a day trip to explore Golden Gate Park. Not having any real destination in mind, I decided to head west, out towards the Pacific Coast Highway. A half-mile to the north stood the Cliff House, an impressive building once owned by Adolph Sutro, now owned by the National Parks Service. Sutro, a Prussian engineer, had made his wealth from mining operations in Nevada and real estate investments in the San Francisco area. He had become mayor of San Francisco and a philanthropist, giving back to city residents and even opening his home as a sort of museum to display the treasures he had acquired during his travels. He bought the original Cliff House in 1881, 18 years after it was first built, and revived it by both repairing it and building a short railroad to help draw in the wider public. A concrete wall, about four-feet high, blocked my view north as I approached the Cliff House. When I got closer to it, I glanced over and found a small beach littered with crumbling structures: a semi-circular wall, surrounded on the outside with hard-packed dirt yet empty in the center, intersected with the western edge of a concrete pond. Just east sat a small concrete bunker, half buried in the side of the hill that led down to the ruins, covered in a mixture of brush and graffiti. A cave bored into the rocky cliff to the north and above it, built into the cliff side, was a cleared area. I climbed down the hill using an access road just below a crab shack, wondering what this place was. The Cliff House I knew. It had been nothing more than a small roadhouse, a way station for visitors, before Sutro purchased it and made it a tourist destination. I had never heard, however, of anything on the small, near-hidden beach just north. After I reached the bunker and climbed inside, I paused for a moment and wondered what else was buried beneath me. A rush of excitement passed through me as I envisioned more than just a singular concrete bunker, but a vast network of lost buildings and tunnels. Looking out, I noticed that the rectangular pond's eastern side ended irregularly. Dirt from the hill spilled into it at differing angles, not unlike the sand that spilled into the sea on the beach just beyond. Parts of the pond, too, had been covered by earth. I stood wondering who had built this and how old it might be. The Cliff House itself was over a hundred years old. It had survived a fire in 1894 to be rebuilt by Sutro. It even survived the great 1906 earthquake only to be burned again in 1907. What, then, was this place, and why didn't it share the phoenix-like story of the Cliff House? I hopped down, half-hoping that the jolt from my landing might crack the earth and send me falling into one of the tunnels I imagined beneath me. I continued on to the cave carved into the side of the hill, its floor made of coarse sand, unlike the hard, packed dirt outside. About halfway through the cave a rusted handrail blocked a small, jagged hole, just large enough for a man to fall through. It led to a beach about eight feet below, hidden by the rocky coast. The end of the cave opened out onto a rock-strewn beach. I had expected to find more ruins, but the absence of anything man-made just added to the mystery. Why a cave to nowhere? What had it led to? I exited the cave and walked back out towards the pond. Along the western side of the pond, dull metal spikes jutted up at varying heights. To the south end, a small dais with half a set of concrete steps led down to the rocky beach. While I explored, I couldn't help wondering how many knew what once had stood here. If I had asked, could the true history of the place have been explained it to me? And did I really want to know? Several weeks later, a friend happened to mention the Sutro Baths in passing. "Where are they?" I asked. "Over near Golden Gate Park. On the beach," he replied. Instantly, I knew what he was talking about. The mystery, whether I liked it or not, began to unfold. In the months following, I struggled between wanting to either read all I could find about the Baths or simply letting them remain unknown. I visited them again, this time with a camera. I wondered if I really wanted to know what this place was, and if knowing that would make me feel different. If I learned about it, would that somehow change the magic of it? Would mystery remain if the ruins were assigned a history? In the end, my desire to know the Baths' story outgrew my desire to keep the magic. I discovered that the concrete bunker had once been the foundation for a huge seating section where thousands could sit and watch swimmers. The concrete pond, once seven separate and independently heated pools, had its water supply recycled by the ocean during high tide and by pump during low tide. A honey-combed building is all that remains of the pump house. And the tunnel to nowhere? It was once a part of the recycling system that fed water during high tide, its coarse-sand floor the result of blasting a hole into the rocky cliff face. 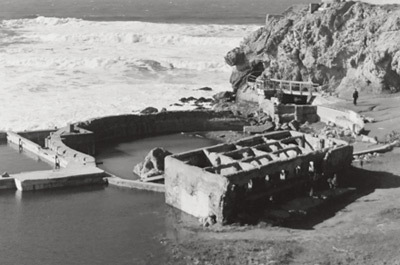 This is all that remains of the Sutro Baths. Financed by the philanthropist for whom it was named and opened in 1896, the baths housed the largest indoor swimming facility until late in the 20th century and were built at an estimated cost of $1 million. The Baths could accommodate 10,000 people at a time. Guests could enter the pool through trampolines, diving boards, and slides. The complex housed a concert hall, seating for thousands, and even more treasures from Sutro's personal collection. 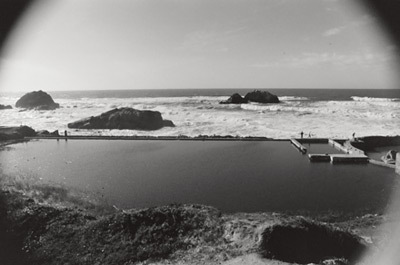 Sutro died two years after the opening, and the Baths struggled to stay financially afloat. Sutro's grandson tried to extend the Baths' life by adding an ice skating rink but, in the end, it wasn't enough. They were sold in 1952 to a developer who closed the facility for good in 1966. The entire structure burned to the ground shortly thereafter. Unlike with the Cliff House, fire was the end of the Sutro Baths. Now ducks swim where San Francisco's high society had once partied and relaxed. Visitors can walk through walls 40 years gone. When I return to the site now, I know exactly what is missing. There are limits to what I can imagine below the surface. But as I left on that day in December, I passed a couple of signs mounted on the hill that, if I had stopped, might have told me the history of the Baths, of Adolph Sutro, his philanthropy, and the fires that seem to dog his legacy. For that one day, at least, I wouldn't let myself know. I stopped only to light a cigarette before walking back to my truck. Matthew Roberts is a software engineer for a publisher in Northern California. He labors under the delusion he can both write and sing, though not at the same time.